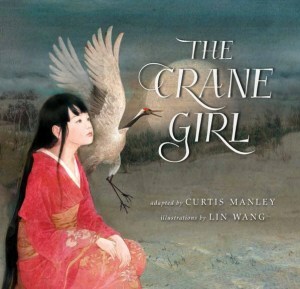 Curtis Manley is the author of the new children's picture book The Crane Girl, based on a Japanese folk tale. 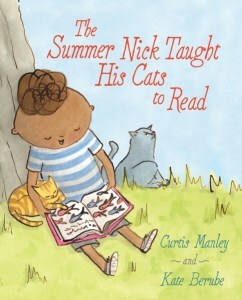 He also has written The Summer Nick Taught His Cats to Read and the forthcoming Shawn Loves Sharks. 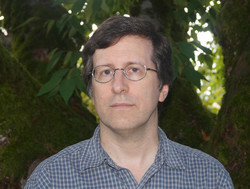 His work has appeared in Odyssey, Faces, and AppleSeeds. He lives in the Seattle area. Q: Why did you decide to adapt this Japanese folk tale, and how did you change it from the original? A: Over the years I’ve enjoyed reading many different folktales and legends from around the world, but have been especially drawn to those from the Pacific Northwest and from Japan. When I heard The Decemberists’ album The Crane Wife in 2006, I was reminded of how much I liked that specific Japanese folktale. It involves a man who rescues and sets free an injured crane; soon after that, a beautiful woman knocks on the door asking to stay. Eventually they marry. When his new wife mysteriously weaves fabric that he sells for a good price in the market, the man’s greed for more causes the woman to leave forever. My change was to have not an adult but a young boy rescue the crane, and it is a young girl who appears at the door seeking shelter. The boy’s father is the one who becomes greedy, not the boy, and so in the end the boy and girl are able to remain together. My adaptation retains all the traditional elements of the plot, but involves main characters close to the reader’s age—and it ends on a more positive note. Q: You incorporate haiku along with your story. Why did you choose to do that? A: I tend to include specific things that I particularly like in each of my books, whether the story I’m telling is nonfiction, fiction, or even a folktale. I enjoy poetry, and write and publish free verse as well as haiku (and its cousin, senryu). I’ve been part of a small, Seattle-area haiku group since 2005. For me, when I’ve been reading or writing haiku, my brain will begin trying to fit what I’m seeing, hearing, or feeling into a haiku form even as I’m experiencing it. Calling that “thinking in haiku” is not truly accurate, since only some thoughts are involved—but when it’s happening, it can seem that way. When I was just beginning work on The Crane Girl, I knew I wanted to include haiku along with references to certain foods, crops, and customs. Using the haiku to reveal the thoughts of the characters then came naturally—at least, that’s how I remember it now. Q: What do you think the illustrations, by Lin Wang, add to the book? A: Folktales, like epic poems and Shakespeare’s plays, retain their relevance and power even if retold in new settings. Nonetheless, setting The Crane Girl in pre-industrial Japan kept it closer to the roots of the original folktales—and the itinerant storytellers who performed them. Lin’s images bring that setting to life in the specificity of detail in the house, village, and clothing—and the in the crane’s plumage and features. But at the same time the beauty and luminosity of the illustrations also give the reader hints at the magic that underlies the story—magic that the boy and his father are mostly unaware of until the end. The cover and interior illustrations are so gorgeous that I hope no one is let down by the words and poems of my text! Q: You also have another new book coming out this spring, Shawn Loves Sharks. What can you tell us about that? 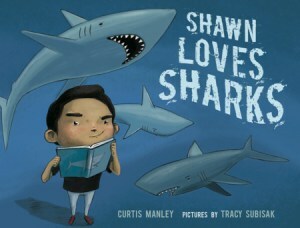 A: Shawn Loves Sharks is actually the first book I sold. It’s taken three years to appear because sometimes the road to publication has a long, winding detour! But I’m very happy with how the book turned out, with wonderful, dynamic illustrations by Tracy Subisak. The book came to me very differently than the others. The title just popped into my head. But that’s all I had: a title. I didn’t know who Shawn was or what he was like. I didn’t know what other characters there might be. I didn’t have any idea about a plot. So I had to sit down and actively figure out all those things. I learned that Shawn thought about sharks all the time. He loved their dark, blank eyes. He loved their big mouths full of sharp teeth. He loved pretending to be a shark at recess and chasing the other kids—especially Stacy, who screamed the loudest. To turn those elements into a story, a conflict was needed. So I threw a challenge at Shawn: for Predator Day at school, Great White Shark is assigned to… Stacy. A: Late last year I sold a nonfiction picture book manuscript about potentially habitable planets around other stars. Just Right—Searching for the Goldilocks Planet should be out in a few years from Roaring Brook Press. I’m now playing with ideas for other nonfiction topics in the same lyric style. It’s possible that none of those projects will amount to anything, but an idea that feels right is always worth writing down and exploring—at least for a while. A: Just that I enjoyed your questions and am grateful for the invitation to be interviewed! Oh, and you can find more about me at my website, curtismanley.com.